Eeek! Imagine a rodent that weighed a ton and was as big as a bull. Uruguayan scientists say they have uncovered fossil evidence of the biggest species of rodent ever found, one that scurried across wooded areas of South America about 4 million years ago, when the continent was not connected to North America. A herbivore, the beast may have been a contemporary, and possibly prey, of saber-toothed cats - a prehistoric version of Tom and Jerry. For those afraid of rodents, forget hopping on a chair. Its huge skull, more than 20 inches (50 centimeters) long, suggested a beast more than 8 feet (2.4 meters) long and weighing between 1,700 and 3,000 pounds (750 and 1,350 kilograms). Although British newspapers variously described it as a mouse or a rat, researchers say the animal, named Josephoartigasia monesi, actually was more closely related to a guinea pig or porcupine. "These are totally different from the rats and mice we're accustomed to," said Bruce Patterson, the curator of mammals at the Field Museum in Chicago, adding that it was the biggest rodent he had ever heard of. An artist's rendering showed a creature that looked like a cross between a hippopotamus and guinea pig. The fossil was found in 1987 about 65 miles west of the capital of Montevideo, near the vast River Plate estuary - a muddy waterway separating Uruguay from Argentina that empties into the South Atlantic. That area is the site of ancient riverbanks and other deposits where fossils have been found. An Argentine fossil collector identified as Sergio Viera donated the skull to Uruguay's National History and Anthropology Museum nearly two decades ago, said museum director Arturo Toscano. It spent years hidden away in a box at the museum and was rediscovered by curator Andres Rinderknecht, who enlisted the help of fellow researcher Ernesto Blanco to study it. Blanco told The Associated Press he was shocked when he first came face to face with the fossil, saying it looked even bigger than a cow skull. "It's a beautiful piece of nature," he said in an interview. "You feel the power of a very big animal behind this." Blanco said the skull's shape and the huge incisors left no doubt they were dealing with a rodent, but he cautioned that the estimate of the animal's bulk was imprecise. 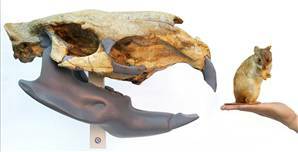 The extinct rodent clearly outclassed its nearest rival, the Phoberomys, found in Venezuela and estimated to weigh between 880 and 1,500 pounds (400 to 700 kilograms). Blanco said the rodent was far more enormous than any South American rodent alive today, surpassing even the present-day capibara that can weigh up to 110 pounds (50 kilograms). He said the animal's teeth pointed to a diet of aquatic plants. "From what we can tell, we know it was a herbivore that lived on the shores of rivers or alongside streams in woodland areas," Rinderknecht told the AP. "Possibly it had a behavior similar to other water-faring rodents that exist today, such as beavers, which split their time between land and water." But he said the rodent appears to have had no tail, adding that follow-up studies are being planned to better determine its diet and other traits. Cat vs. mouse vs. bird? The creature may have been a contemporary to the saber-toothed cats and giant carnivorous birds that roamed the area millions of years ago, but Blanco said it was not clear whether such predators had the power necessary to bring down the huge beast. "This investigation began about a year and a half ago but it's still not complete," Rinderknecht said, adding that the next step may be a CT scan of the skull "to better determine its interior dimensions." The research by Rinderknecht and Blanco was published Wednesday in this week's issue of biological research journal, Proceedings of the Royal Society B. Scientists uninvolved with the finding agreed that this was one really big rodent. "I think it's a very important discovery - it is certainly an immense animal," said Mary Dawson, a paleontologist at the Carnegie Museum of Natural History in Pittsburgh. She said it and other rodents grew bigger by filling the ecological niche taken elsewhere by rhinoceroses and hippopotamuses. "They got large taking the role of some herbivores that were not present at that time - South America was still an island continent," she said. But when North and South America were linked about 3 million years ago, the rodents were swamped by North American animals and eventually died out. "It's too bad they're extinct, I'd love to see those things," she said. Patterson said its discovery gave scientists more insight into the fauna of the prehistoric South American continent, when it hosted creatures such as marsupial predators and hoofed animals known to scientists as archaic ungulates. "These were things with trunks on their noses, huge claws on their hands, they look like somebody just made them up," he said. Few traces of big rodents are left today. Josephoartigasia monesi's closest surviving cousin, the pacarana, is endangered. That sharp-clawed 33-pound (15-kilogram) rodent lives in the hills around the Andes Mountains. It is considered among the largest living rodents, but its slow rate of reproduction - and reputation among humans as a tasty treat - means its prospects are grim. Blanco said he was thrilled with the discovery of the huge rodent after so many years. "When you start to open all these boxes, often times you find all kinds of interesting pieces of paleontology," he said. "The collector alerted us that it was an important fossil," Toscano said, adding that the skull remains carefully packed in a box in the museum's paleontology collection. Both Blanco and Toscano said they hoped the find would attract more resources to museums such as the one in Uruguay - which is so strapped for cash it has been unable to hold public exhibitions since 2000. Associated Press writers Raul Garces and Alfonso Castiglia contributed to the report from Montevideo, Uruguay.